Sporty handling, control for demanding conditions and high wear resistance with Nokian Aramid Sidewall technology. Perfect driving pleasure, quick reactions and best possible wet grip for SUVs. The new sporty Nokian zLine SUV summer tire provides precise handling, extreme durability, safety for demanding conditions and perfect driving pleasure. Its sidewalls are reinforced by the highly durable Nokian Aramid Sidewall technology. Aramid fibers are also used in the aviation industry and provide much-needed durability to drivers wishing to unleash the full potential of their powerful SUVs. The best possible wet grip for the varying North American asphalt roads make the largest SUVs safer. The Nokian zLine SUV steers logically, quickly, and responsively at high speeds. It is the latest display of skill from the world's northernmost tire manufacturer from Finland that combines SUV owners' requests for safety under extreme conditions, pleasant comfort, and care-free driving. The Nokian zLine SUV exudes power, and it is designed for the largest SUVs. The comprehensive selection of 24 sizes from 17 to 22 inches has the speed ratings V (149 mph/240 km/h), W (168 mph/270 km/h), and Y (186 mph/300 km/h). All will be available to consumers in the spring of 2015. The sporty and precise Nokian zLine SUV is the result of nearly four years of careful development, and its unique durability and handling properties are the key features setting it apart from its predecessors. “More durability, state-of-the-art handling, and the best possible safety for rain-slick roads. Drivers who want to enjoy the power of their SUVs will value durability in addition to a precise and comfortable driving feel,” says Product Development Manager Juha Pirhonen from Nokian Tyres as he lists the characteristics of the Nokian zLine SUV. SUV tires are most often damaged by impacts to the tire sidewall. The Nokian zLine SUV uses Nokian Aramid Sidewall technology to maximize impact and cut protection. The sidewall compound includes extremely durable aramid staple fiber, and it is exceptionally resistant to wear and cuts. The same material is also utilized in the aviation and military industries. The aramid fiber stiffens and reinforces the sidewall to even better withstand external impacts and pressing against the wheel flange. Durability for the varying North American road conditions is also optimized by means of a strong steel belt structure and a new tread compound that is tailored for hot conditions and demanding use. The developer of the world's first winter tire builds its product development philosophy on tailoring products and testing them under actual conditions. The handling and grip properties of the logically behaving Nokian zLine SUV were refined on the rough Northern roads and the European high-speed circuits. The creation of the excellent wet grip and aquaplaning properties utilized high-speed camera footage, providing essential information about the interaction between the road and the tire. The modern, asymmetrical tread pattern of the highly durable and stylishly sporty Nokian zLine SUV perfectly supports the precise handling of this high-performance tire. The rigid inside and outside shoulder area connects with large block patterns that are bound together by longitudinal ribs. The wide, massive ribs stiffen the tire and reduce the movement of the pattern blocks during road contact. The tread pattern is very stiff, which translates into excellent handling in the corners. The steering feel is precise and quick even under a heavy load and at high speeds. The Cornering Precision Shoulder provides logical handling for lane changes and cornering, along with the asymmetrical, beveled groove corners that also improve stability. The hemispherical indentations, reminiscent of a golf ball pattern, on the walls of the longitudinal ribs provide additional driving comfort. This Silent Groove Design innovation reduces the interior noise and external rolling noise of the vehicle. The design also reduces air resistance and cools the surface of the tire, in turn improving wear resistance. Several innovations are used to fight the ever-present danger of aquaplaning. Aggressive Blade Grooves cut through the ribs in the center area, effectively storing water and guiding it towards the longitudinal grooves. Trumpet Grooves were also shaped in the shoulder areas in order to improve safety. The bullet-shaped indentations, which have been optimized for flow, store water from between the tire and the road, accelerating its flow from the main grooves towards the transverse grooves and maximizing grip even on rain-soaked roads. The flow of the water displaced by the surface tread is also accelerated by the four wide and polished main grooves. Polishing the grooves gives the Nokian zLine SUV an even more appealing look and also improves its aquaplaning properties even further. The zLine Coral Silica tread compound uses the latest compound technology, and it was especially tailored for the higher speeds of the Central European asphalt roads. The micro-porous silica and the molecular chains in the functional rubber compound form a coral-like structure that has a wide contact surface but remains extremely rigid. This innovative compound allows the Nokian zLine SUV to remain rigid and to maintain reliable road contact even during fast driving and in tight corners. The rubber compound works ideally along a wide temperature range, improving wet grip from spring to autumn. The feel of the road remains stable and provides no surprises under any conditions. The cut-resistant new compound also enhances driving comfort by damping the noise generated by uneven asphalt. The tread surface is equipped with the Driving Safety Indicator (DSI), patented by Nokian Tyres and favoured by drivers who value safety and carefree operation. The numbers indicating the groove depth and the water drop symbol indicating the risk of aquaplaning are immediately visible to a driver inspecting the tires installed on a vehicle. The water drop symbol disappears at the point that less than four millimeters of tread are remaining, indicating an increased risk for aquaplaning. 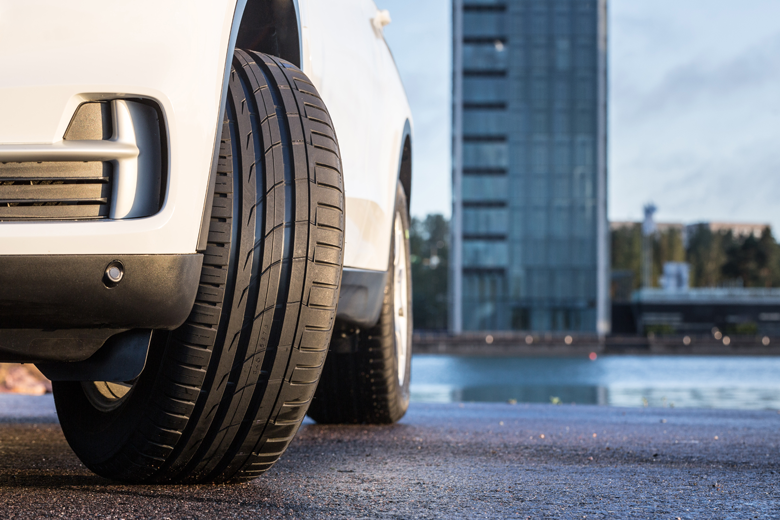 The location and pressure indicators on the sidewall information area of the Nokian zLine SUV improve safety. The information area allows for recording the correct inflation pressure and installation location during tire change. Comfort and safety are improved further by a new section that can be used to record the tightening torque of bolts for alloy rims. Nokian Aramid Sidewall technology Unique durability. The sidewall compound includes extremely durable aramid staple fiber, and it is exceptionally resistant to wear and cuts. The same material is also utilized in the aviation and military industries. The aramid fiber stiffens and reinforces the sidewall to even better withstand external impacts and pressing against the wheel flange. Blade Grooves. Safety on wet roads. Aggressive blade grooves cut through the ribs in the center area, effectively storing water and guiding it towards the longitudinal grooves. Trumpet grooves. Effective aquaplaning prevention. The shoulder areas have trumpet grooves, bullet-like indentations that have been optimized for flow; they store water from between the tire and the road, accelerating its flow from the main grooves towards the transverse grooves and maximizing grip. zLine Coral Silica tread compound. More precise handling, better wet grip. The molecular chains between the micro-porous silica and the functional rubber compound form a coral-like structure that has a wide contact surface but remains extremely rigid. Reliable and balanced road contact even at high speeds and in sharp corners. Also improves wet grip and wear resistance. Silent Groove Design. More driving comfort. The hemispherical indentations, reminiscent of a golf ball pattern, on the walls of the longitudinal ribs provide additional driving comfort. The innovation reduces the interior noise and external rolling noise of the vehicle. The design also reduces air resistance and cools the surface of the tire, in turn improving wear resistance. Nokian Tyres, Inc./Nokian Tyres Canada, Inc.